For the first time, scientists have produced monkeys composed of cells taken from separate embryos. 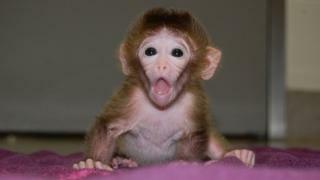 The animals were born after researchers combined cells from different embryos and implanted them into female monkeys. Such animals, which contain genetically distinct groups of cells from more than one organism, are called "chimeras". A US team, which has reported its work in the journal Cell, says the advance could have "enormous" importance for medical research. Chimeras are important for studying embryonic development, but research has largely been restricted to mice. The three rhesus monkeys, named Chimero, Roku and Hex, are said to be normal and healthy. They have tissues made up of a mixture of cells representing as many as six distinct embryos. "The cells never fuse, but they stay together and work together to form tissues and organs," said co-author Shoukhrat Mitalipov of the Oregon Health and Science University in Portland, US. Initial efforts by Dr Mitalipov's team to produce living monkey chimeras by introducing cultured embryonic stem cells into monkey embryos - a well-established means for generating chimeric mice - failed. Stem cells are the "master cells" that can transform into a variety of more specialised cells required in the body. The embryonic stem cells the team tried and failed with were at a developmental stage known as "pluripotency". This means they can transform into any tissue type in the body, but cannot turn into the placenta or an entire animal. The researchers were only able to make monkey chimeras when they mixed cells from very early stage embryos, in which each individual embryonic cell was "totipotent". These totipotent cells are capable of giving rise to a whole animal as well as the placenta and other life-sustaining tissues. Dr Mitalipov said it appeared that primate embryos prevented cultured embryonic stem cells from becoming integrated as they do in mice. The study also suggests that cultured primate and human embryonic stem cells, some of which have been maintained in labs for as long as two decades, may not be as potent as those found inside a living embryo. Prof Robin Lovell-Badge, from the UK National Institute for Medical Research in Mill Hill, called the advance "very important". The researcher, who was not involved in the study, told BBC News: "Assumptions about the way human embryos develop have always been based on the mouse." But he added that this could be a "dangerous assumption". Chimeras can be used to understand the role of specific genes in the development of embryos as well as for studying the overall mechanisms of development. For example, if studying a genetic mutation that causes cells to die, it is much more useful if the embryo is rescued by normal cells that allow the scientists to continue their work. Prof Lovell-Badge said there had been a growing feeling for some time that pluripotent stem cells from humans and monkeys were different from those in mice. The latest research suggests the biological pathways to restrict cells in their ability to form different tissue types are passed earlier in monkeys than they are in mice. "We cannot model everything in the mouse," Dr Mitalipov explained. "If we want to move stem cell therapies from the lab to clinics and from the mouse to humans, we need to understand what these primate cells can and can't do. "We need to study them in humans, including human embryos." But he stressed there was no practical use for producing human chimeras. Stem cell therapies hold promise for replacing damaged nerve cells in those who have been paralysed due to a spinal cord injury and, for example, the brain cells lost in Parkinson's Disease.